Not a bad couple of weeks from a training and racing perspective. I always seem to move up a level as the weather takes a turn for the better! 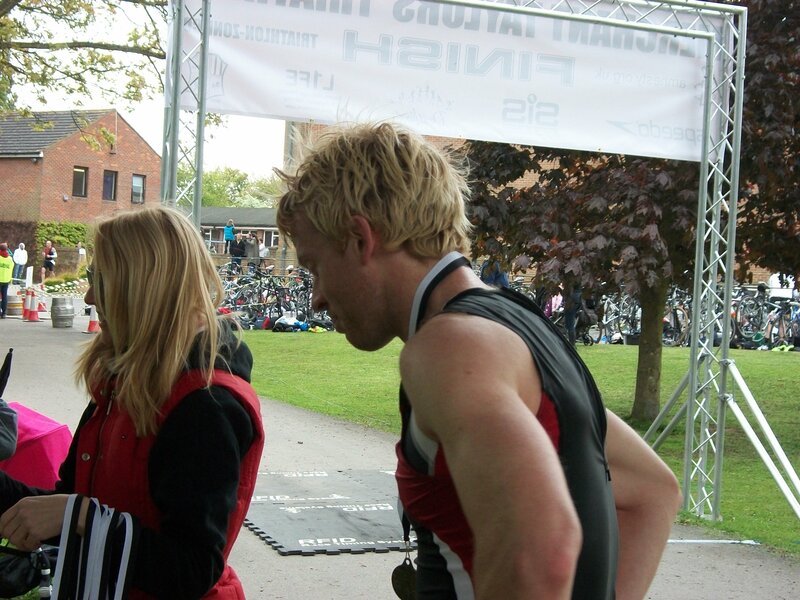 My first Triathlon of the season at Merchant Taylors was the perfect race to kick-start the season, being quite technical. Obviouslly really pleased to get the win, but there were a number of issues that slowed me down. Better now than during the Ironmans! Despite seeing some positive results in my cycling and running endurance sets, I’ve not been enjoying the swimming. I’ve had blocked and sticky ears over recent months, and after a cold two weeks ago and elevated HR the GP told me I had ‘glue-ear’ http://www.patient.co.uk/health/Glue-Ear.htm Following the triathlon I’ve had a build-up of pressure and swelling behind the ears. I’m now on antibiotics. Feeling pretty rough and light-headed at the moment, so will call in on the GP next Friday and get an update. I don’t want to drive to and race the TriGrandPrix next Sunday unless I’m clear. I want to be 100% for this race as it’s quite high profile with a decent standard. A few changes were made to the Ceepo after the disappointing split at the Worcester Duathlon. Already mentioned the great Bike-Fit from Andy Sexton. I’ve also brought the tri-bars back (as I like to grip over the bar-ends) and replaced the old Selle SL 125g with a 185g. Same design, just a tad more cushioning. Used a conventional sports bottle (I will break-in the Speedfil @ the TriGrandPrix), and strapped a co2 tub sealant to the tri-bars! I won’t lie, I felt like I had to win this event, and put a lot of pressure on myself leading up to it. Yve was very supportive as usual, and took some good pics on the day. She was also on ‘bike watch’ during my swim and run as I’d heard stories about the transition security (or lack of!). No-one stopped to check numbers when bikes were being removed. The 6:00 brief/6:40 start meant we had to get up at 3:30am. Despite the early start I didn’t feel too bad. I’d not done a lot of training in the previous week because of the ear infection and elevated HR, so my legs were well rested. At 6:40am we climbed into the lake. I always try and get in around 5mins before the start – enough time to get used to the temp and loosen up, without getting too cold. Swimming has also been my weaker discipline. I’m poor in the pool and over shorter distances, but I can hold a decent, sustained pace over longer, open-water distances. I also train predominantly with a pull-buoy, not only to mimic a lifted hip but also to encourage limited use of the legs. So I was surprised to hold my own in the front pack for the entire 1500m lap. Steered wide right about 400m in and turned the buoy too late but still came home with the lead pack. 22:16 is a PB for me, which included the run to T1. My first problem came with wetsuit removal. I usually take it off as soon as I exit the water and jog into T1 with it over my shoulder. But I was having trouble reaching the draw-chord. Overtook most of the group going in to T1 and finally pulled the suit down to, but then struggled to get the right leg over the timing chip. So I took the unglamorous approach, falling to my arse with a few shouts of “sh*t”. It worked. And despite the lost secs, I came out of T2 right behind the leader. The leader struggled getting feet into shoes along the school drive/speed bumps, so I took the lead on exit to the main road. A big surprise to be leading a race so soon! We were told the 25mile cycle route was both tough and technical in parts with plenty of hills and loops over dual carriageways and country roads. It showed in the times (1:08-1:09 being the quickest). After a couple of miles I was overtaken by Giles Carter (GC) and Mark Brooks (MB). My intention for the rest of the ride was to keep them within reach, giving away no more than 1min at the start of the run. For the first 12-15miles I did just that, but I did notice there was an element of drafting going on between the two. I won’t comment on who was drafting who, suffice to say the gap was generally no more than 2m….which for me is drafting, especially when you see the one behind able to sit up on the saddle. I was angry and frustrated at the time but my complaints to a marshall on the bike course and the exit of T2 (in front of a small crowd) were ignored. A gap of about 300m grew between myself and the leaders on 15miles after my chain came off (I managed to pop it back on while free-wheeling) and the sealant came loose (put it under my tri shorts – see finishing pic!). I was finding it hard work again on the Ceepo and wondered what state my quads in particular would be in after fighting the hills to try and close the gap. The hill at 22miles was a tough one but I decided to take it hard and out of the saddle. Unfortunately the gamble didn’t quite pay off and I didn’t see the leaders until the run. Coming in to the school driveway I took a wrong turn and ended up in the car park! Scanning around for an exit I spotted a path between the grass. Had to hop the pavement a little but it was better than retracing and losing more time. Transition2 was fine but Yve was quiet which I took as a bad ‘they are too far ahead’ sign. But relished the challenge and having taken a few sharp corners at speed I spotted GC and MB, just 50-75m ahead. The run course was also technical. The majority being off-road on grassy tracks around the lakes and cricket pitches, then back along the school drive. Apparently 2 x 5km laps, although I suspect the distance to be a bit shorter than that based on the splits. I was within 5m of GC when I felt the early signs of stomach cramps, so I eased off the pace slightly. For a couple of minutes the gap remained at 50m from MB to GC and myself. The pains in my core were slowly diminishing so I picked the pace up again and after 3km I was in 2nd place, 12secs behind MB. He must have been aware of me at this point because I noticed the gap stabilising despite my increased effort. At the start of the second lap by transition I decided to increase the pace again, to about 90% effort, and was on MBs back after a few hundred metres. We exchanged a few words and then I was all alone for the remaining 4km. Ocassionally looked back along the school drive and didn’t see anyone for 400m+, but still picked the pace up to a sprint on the downhill to the finish. Really chuffed to win the race, and in a decent time despite a few minor errors. Can’t swim a lot at the moment, but I’m keen to get some training in on the Ceepo bike as familiarity should help. Should be some fun sessions around Richmond Park coming up. Impressive – I’ve raced Giles Carter before and he’s a strong competitor. You don’t have weaknesses in any discipline now, which is what’s needed to win races.